If you have joint or circulatory problems, rehab exercise bikes are a great way to put both the lower and upper parts of the body in motion for an effective low impact workout. There are a host of health conditions that can be helped with these motorized pedalers. From MS sufferers and stroke victims, to people with knee replacements or who have poor circulation, if your doctor has prescribed limb movement as part of your physical therapy, these affordable devices provide a convenient workout that can be done in front of the TV, at the bedside, or anywhere. 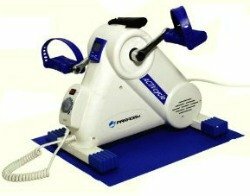 Small compact units such as the Paradigm ACTIVcycle Motorized Exercise Bike have an adjustable speed motor to rotate the pedals. It comes pre-assembled and is ready to use out of the box. It measures 16”W by 16”L by 13”H and weighs just 12.5 pounds. It even includes an LCD display that tracks time, calories, speed, and distance. 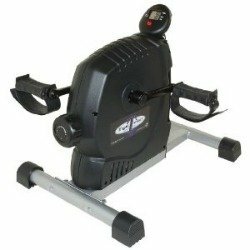 Another popular rehab exercise bike is the MagneTrainer Mini Exerciser which offers the highest amount of pedal resistance of any of these bikes. The adjustment knob dials resistance from zero to 160 Watts. (Other bikes tend to offer less than 50 watts.) Like the Paradigm above, the MagnetTrainer can also be placed on a table to work the arms as well as be placed on the floor, even under a desk, to work the legs. If you don’t need a motorized model, cheaper versions have just a small frame, a crank, and the pedals. 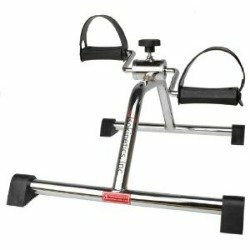 At just 13" tall, the Isokinetics Pedal Exerciser is made of high quality chrome-plated steel tubing and has an adjustable tension knob. This $20 rehab mini bike can be used as a foot pedaler or hand pedaler. If you want something simple and un-complicated, this one gets the best reviews of all. 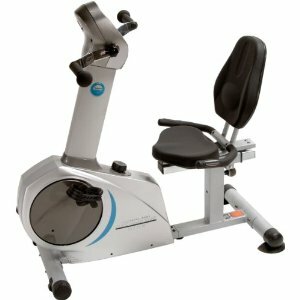 Many people use full size recumbents as rehab exercise bikes although most designs are equipped with foot pedals only. There are models that also include separate rotating hand pedals such as the Stamina Elite Total Body Recumbent which runs about $799. It offers the same aerobic benefits of riding a stationary bike, and works the shoulders and arms. It has a comfortable reclined seat to alleviate back pain, and includes pulse rate sensors on the side handlebars to read your heart rate during workouts. These are just a few examples of affordably priced rehab exercise bikes, which is actually a category that covers a wide range of styles. From the manual pedalers that start at $20 to the motorized pedalers at $80 to $150, and a wide range of recumbent bikes from $399 to $2000, there is a home model that will be ideal for your health and rehab needs.